As international students pack their bags and prepare to embark on an education experience abroad, visions of the journey that lies ahead may be filled with romanticised, idealistic images. Playing American football with their host family brothers, joining their domestic student friends for study groups, being invited to celebrate holiday traditions in a local home…but as the reality of culture shock sets in, how can students find the time, the courage and the motivation to integrate with the native culture? 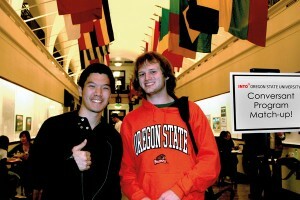 At Oregon State University, integration successes are plentiful. In the newly-built International Living-Learning Center, home to the INTO OSU program, domestic and American students alike can be observed meeting in groups, walking together to and from class, sitting side-by-side in classrooms. International students live with American roommates – sharing rooms as well as their different cultural perspectives. Walk through the building and you’ll find people from around the world living and learning together. Among the many activities and programs at INTO OSU designed to foster integration are the Conversant Program, the international and American roommate matching, and classes that combine American students with international students for a cross-cultural experience. 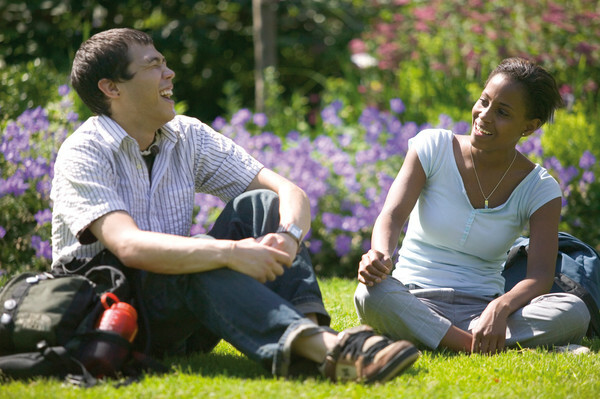 The Conversant Program offers international students the chance to be paired with an American partner to meet for conversation one hour per week. The program boasts almost 200 American student volunteers—a large number by campus volunteer standards, but still not quite enough to accommodate all international students on a one-on-one basis. The program is competitive, with the first international students to sign up (and those with lower-level English skills) taking higher priority to receive a partner. The lasting friendships made are a testament to the program’s success. Sarah Jou-hsuan Chen of Taiwan met her current roommate through the Conversant Program during her first year as an INTO OSU Pathway student. INTO OSU students also take classes alongside their American counterparts, often being paired with domestic students for exercises, discovering first-hand, the challenges and rewards of communicating in an authentic cross cultural context. Sometimes knowing the path and walking the path are two different things, but giving students the tools they need to make those steps easier can help set them on the right direction towards success.